A lot of slatwall displays are boring. But, that doesn’t have to be the case. In this blog series we’ve been discussing ways to jazz up your slatwall display. The first two parts of this series had numerous examples of creative ways to make your slatwall display more interesting and visually appealing. If you missed those posts, you can check out Part I here and Part II here. Today, we will continue our series by sharing 6 more examples of slatwall displays that we have designed to stand out. The first example shown below is one we designed for Reverse-A-Purse to merchandise the company’s line of reversible purses and handbags. We started with a standard 2-sided slatwall panel and added a metal tube frame with decorative wire swirls on the sides and top. We utilized simple waterfall arms to hold the handbags and added sheet metal oval signs with screen-printed graphics on the sides and top to highlight the brand. 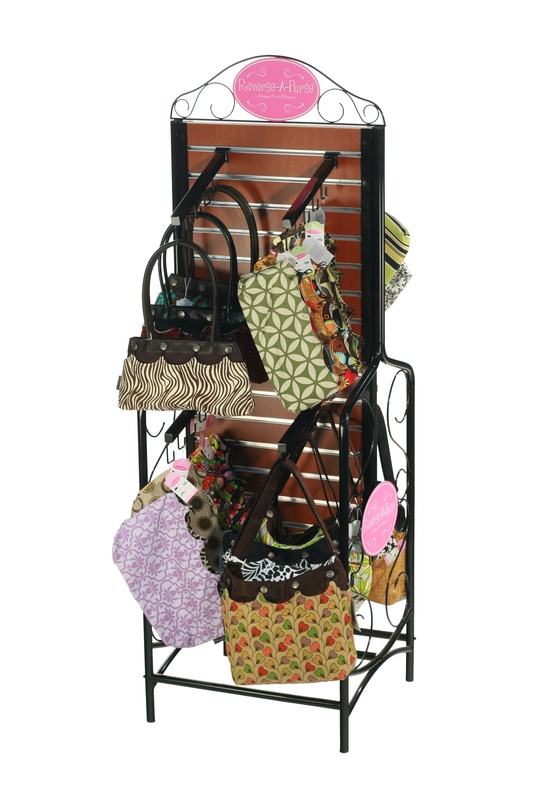 This display is well suited for any retail boutique or line of fashion/accessory products. Slatwall displays don’t have to be confined to the floor. 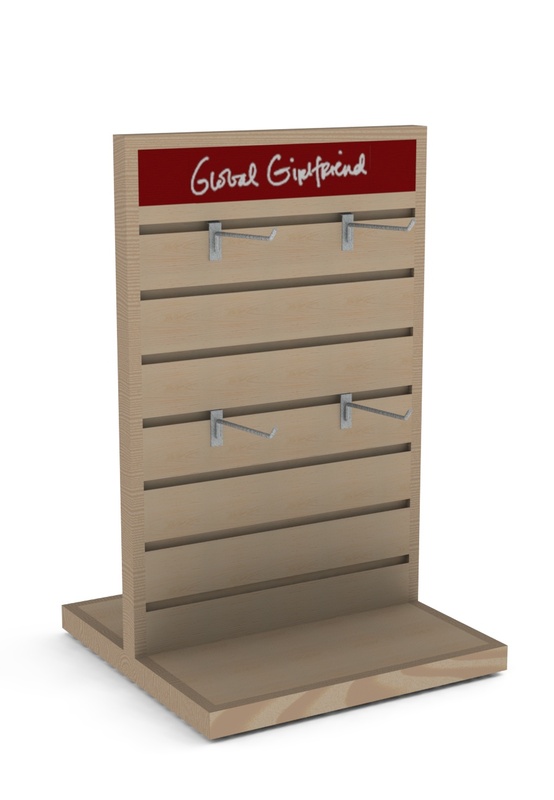 We designed the slatwall counter display below for Global Girlfriend. Counter slatwall displays are far less common than slatwall floor displays, but they can be equally effective. 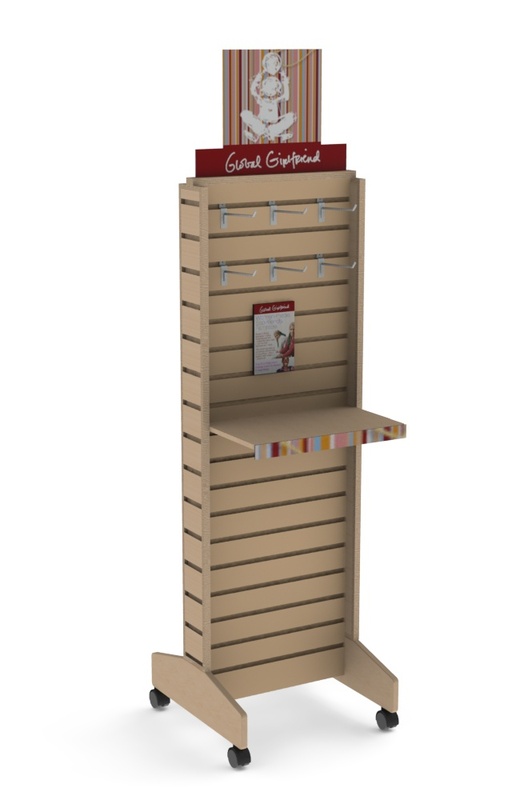 One of the things that makes this slatwall display attractive is its solid wood trim. Compared to a metal frame, the wood trim gives the display a natural and authentic look. We added a screen printed inset acrylic header which provided simple and clean branding. We also designed a companion slatwall floor display which shared many of the same design features. We incorporated narrow format slatwall side panels to increase the merchandising capacity of the fixture. In addition, we designed a hanging slatwall sign and changed up the header from an inset design to a two-part topper sign. Finally, we designed a matching shelf with a colorful shelf edge to match the upper portion of the header sign. Our fourth example illustrates how slatwall can be integrated with other materials to create a unique and highly functional floor display. 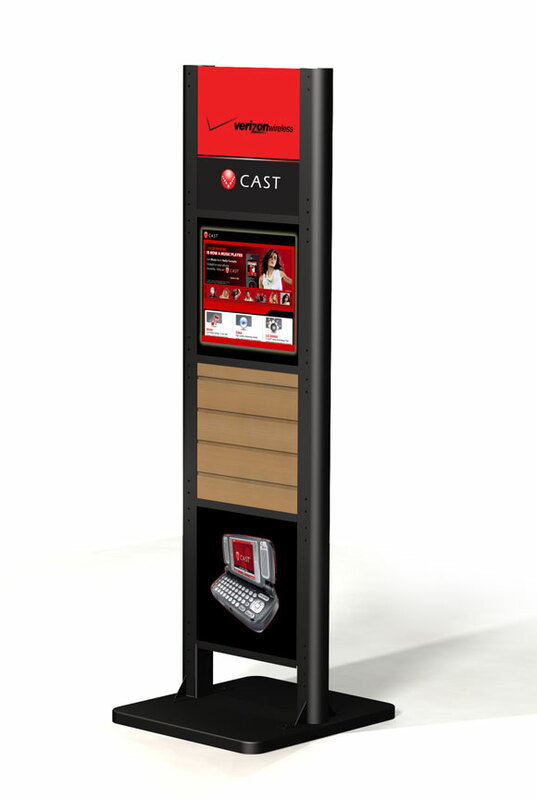 The Verizon display shown below features a metal base and frame, upper and lower lightbox graphics, a digital media player, and a small slatwall section for pegged product. While this probably wouldn’t be classified as a slatwall display, it is a good example of how slatwall components can be integrated into almost any type of display. Our last two examples show how our stock 2-sided slatwall display (SW-62FL) can be customized by adding different types of signs and graphics. The picture below is a design we did for GoPole. 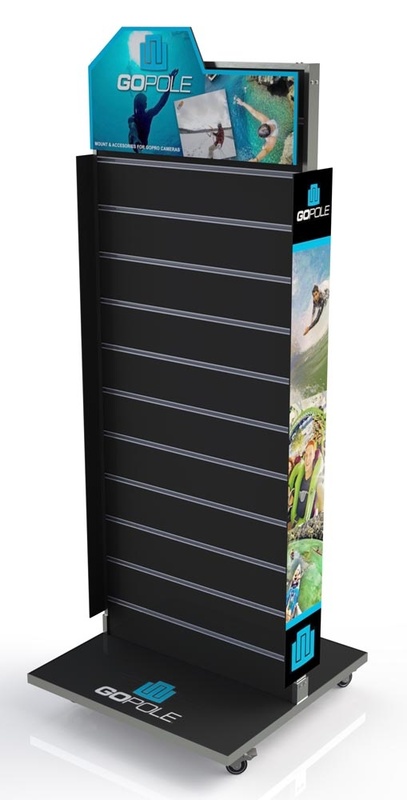 We added PVC side signs, screen printed base graphics, and a signature die-cut header graphic to promote the GoPole brand. Much like the above example, we customized our SW-62FL for Griffin Technology by adding full-length, die-cut side signs and a high-end header sign made of white MDF, clear acrylic with stand-offs, and laser-cut dimensional logo/letters. Stay tuned for our final installment of our 4-part series on slatwall displays.